Players have a chance to try Sea of Thieves again this weekend, following on from the first beta earlier in the year. Rare are using this Scale Test phase to test work they’ve carried out on Sea of Thieves since the closed beta, and to see if they can accommodate more concurrent players than they did before. The first Sea of Thieves beta received a positive response, and if the finished package lives up to expectations, it could be one of the best pirate video games ever made. Assassin’s Creed: Black Flag, The Secret of Monkey Island, Sid Meier’s Pirates!, and other games have all let us live out our pirate-themed fantasies in various ways, but Sea of Thieves takes it to another level. First and foremost, as anyone who played the Sea of Thieves beta will know, it’s gorgeous to look at. The game has a cartoony, colourful visual style different to the more realistic approaches plenty of games aim for today. This doesn’t mean there isn’t an amazing level of detail though, as the world in which it’s set is packed with character, charm, and lush environments. This larger than life feel extends to the gameplay too, with players able to shoot each other out of cannons (just like real-life pirates of old did! ), come face to face with tough skeletons and even take on a kraken. The latter will be present as a public event, triggered whenever you sail within its range. Other ships will be able to join yours, and it will take skill and team-work to defeat, given the massive damage the kraken can unleash. It will have the power to strike multiple vessels at the same time with its huge tentacles, grab individual players from the ship, drop them underwater, and more. Rare have designed the kraken events to be endlessly replayable, and it should be different every time. 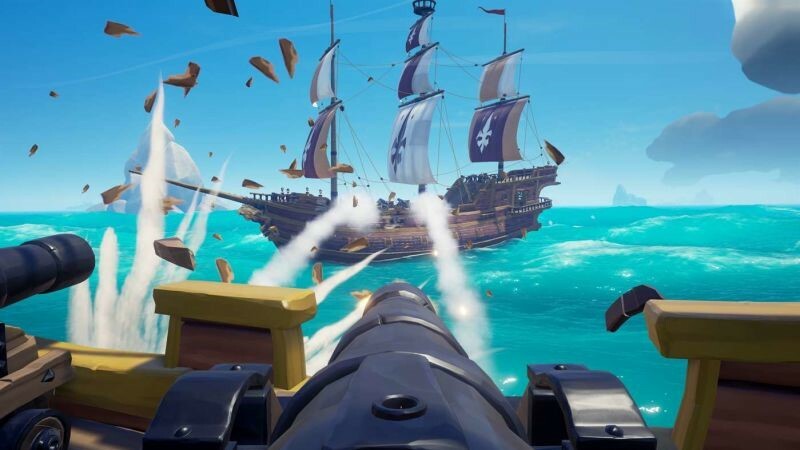 Skeleton forts will be another recurring part of the Sea of Thieves experience, and any players able to conquer them will have access to all of the skeletons’ loot. Carrying it all back to your ship will demand team-work, as other crews will be able to attack you and steal it. All of this shows just how organic and open-ended the world of Sea of Thieves is meant to be. You can choose to play in a number of ways, setting out to sea alone, as a pair, or working with multiple other people on a larger ship. Everyone will have their own roles to perform on big vessels, like steering, navigating, handling cannons etc. Rather than simply aiming the boat in one direction and waiting to arrive at a destination, players will get to experience more of an authentic (though still fantastical) pirate adventure. Before you can embark on your seafaring, you’ll have to make sure you bring up the anchor, prepare the sails to the right angle, and make sure they’re at the right height to let you catch up the breeze. You can’t rest on your proverbial laurels either, with obstacles like rocks, enemy vessels, and more likely to send your ship (and crew) to the bottom of the sea. 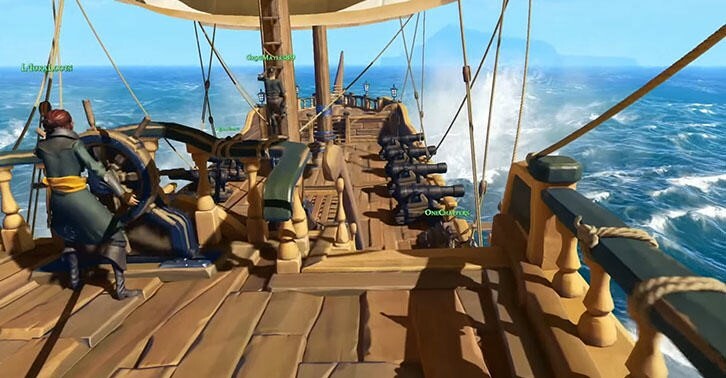 Players will be able to use voice chat to communicate with crewmates and enemies, ideal for a little bit of bonding or banter throughout Sea of Thieves’ adventuring. This is designed to help reinforce the idea of an organic shared world, and can help you immerse yourself even more deeply. Whether this means talking with crewmates to choose a sailing direction or poking fun at a team you’ve just taken down, it should become a natural part of the game. Crews will be able to take quests from Sea of Thieves’ three distinct trading companies. As a result, there will be three separate reputation progression tiers with their own incentives and rewards. The Gold Hoarders are driven by an obsession with treasure, and they’ll send you to track down precious things hidden away on islands scattered through the Sea of Thieves world. One of the coolest things about this is that the Gold Hoarders’ treasure quests are procedurally generated, developing its location and respective clues when needed. The Order of Souls is perhaps the most exciting company, with missions dedicated to bounty hunting. Your quests for them will see you sailing to skeleton-ruled islands to kill their captains, before bringing their skulls back as proof. It’s all pretty ghoulish, but done in Rare’s dynamic cartoony style. Last but not least, the Merchants Alliance doles out quests based around transporting animals across the sea. You’ll need to make sure they survive the journey, and keep other players from getting their filthy mitts on them. Feeding them and protecting them from other animals is key too. There’s more to the game than sailing and completing quests, though. You have plenty of freedom to enjoy, such as tinkering with musical instruments, getting drunk in one of Sea of Thieves’ taverns, and more. Drinking leads to realistic results too, with characters growing dizzy and throwing up after too much indulgence. All of this will prove to be a nice distraction from progression, and let you just relax and enjoy the life of a pirate. When playing Sea of Thieves, you’ll earn reputation points and craft your pirate into a Legend. You get to create your character at the beginning, and you will go on to tweak your hairstyles, accessories, weapons, and clothes throughout. Pets are available too, like cats and monkeys, adding even more to the experience. The points you earn by working with trading companies will help you climb their ladder, getting better items and titles in return. Players will gain access to unique goods, clothing, weapons, and more as you progress, and earning a Legend title will even open up specific quests and collectibles. You’ll be able to gather with other high-ranking players in the Tavern of Legends, a hidden location within the Sea of Thieves world, and go on adventures that in-game friends can tag along for, regardless of their own ranking. 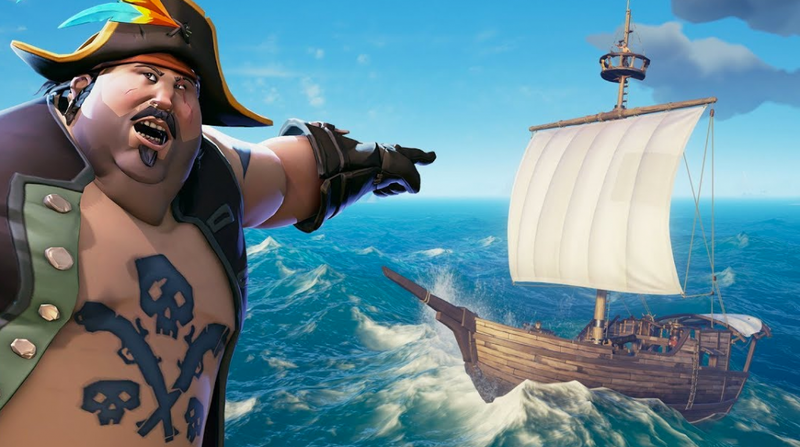 Rare is also looking to let Legends run their own ships too, to show your status off to other players. It all sounds amazing, right? 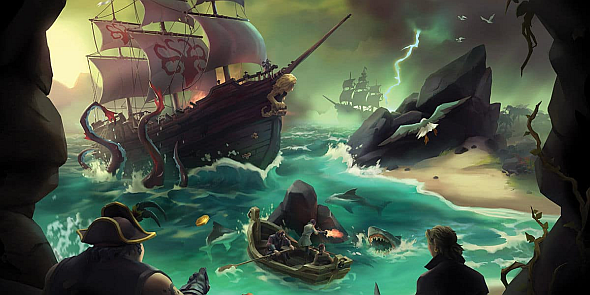 If you’ve played the Sea of Thieves beta, you’ll know there’s real potential for this to be a classic, so let’s hope the full game is the best it can be. The complete, finished version of Sea of Thieves will sail in on the 20th of March, across Xbox One and PC. Have you played the Sea of Thieves beta, and if so, what do you think? What are you most looking forward to doing in the finished game?